It has been nine and a half months since I last posted. Yesterday was Little Jem's first birthday. What follows is Part 2 of his birth story, picking up where Part 1 left off, after my doctor performed a membrane sweep two days past my estimated due date. This post will be structured the same way as Part 1, where I will share the log of birth events I kept on my phone's notes app, annotated in italics with reflection on those events. Keep in mind that these reflective parts of this post are being composed today, a year after they occurred. Also, the dates included in the birth log of this post are all from 2017. The same content warning I included on Part 1 applies here: Content warning: I write about all sorts of bodily fluids in these posts, including blood, urine, diarrhea, and breast milk, because this is all part of the reality of pregnancy and birth, and the whole premise here is: that reality is empowering. Some details about how this app displays the data I entered about each contraction: The green-yellow-red levels on the left side of each entry were my manually entered measurements of how intense each contraction felt. By 11:30 pm, the intensity of contractions had increased significantly. 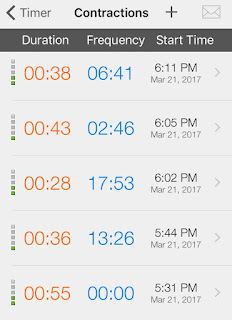 The duration column indicates how long each contraction lasted, while the frequency column I believe indicates the length of time that has elapsed since the previous contraction. 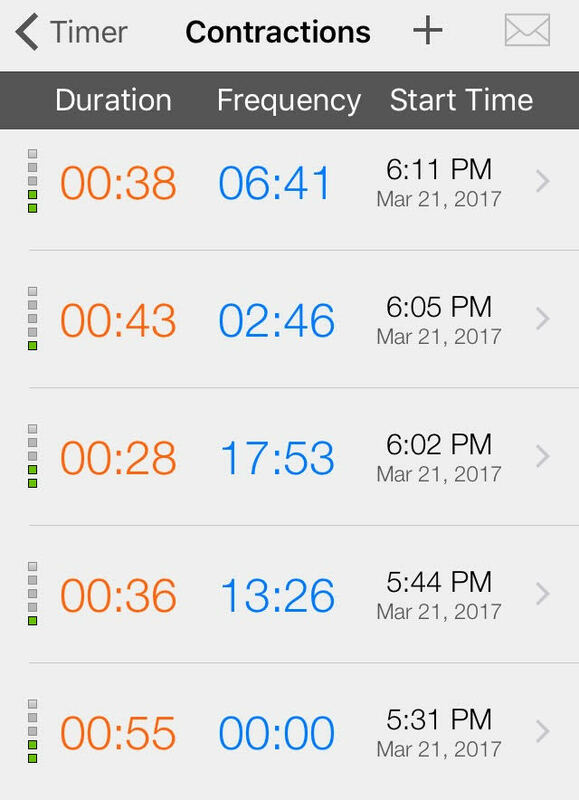 And of course the start time column is the timestamp for that contraction. I have here in my draft of this post "[Describe progression of early labor]", but that draft was composed nine months ago. I'm sad that I won't be able to remember these details so clearly now because it has been a year since I labored with Little Jem. Here's what I can remember though. My mother in law and my good friend Teresa were both at the house. I put Bookie to bed at her normal time of around 7:30 pm, while in early labor. She had seen me bear early labor contractions over the course of the evening, and grew to understand these were okay and although I looked uncomfortable every few minutes, nothing was actually wrong. I read her a story and sat up in her bed next to her until she fell asleep, then I left her room and moved to the master bedroom where Teresa and Paul were waiting for me. My mother in law was on hand to help as well if needed, but I encouraged her to try to sleep, since we didn't know how long labor would go, and if Bookie woke up in the middle of the night and Daddy and I were gone to the hospital, she may have trouble falling back asleep and need her Baba to comfort her. Teresa stayed overnight as well, and wound up helping Bookie settle to go back to sleep after we did in fact leave for the hospital later that night. Teresa had seen me in labor with Bookie five years earlier, and her main role this time around was to be another person on hand to be with Bookie when Paul and I left for the hospital. It turns out with Little Jem, she also helped me labor this time. The period from about 8:00 to 11:30 pm was me laboring in my bedroom, mostly standing, and during contractions bending at the waist and bracing myself against the bedpost while Paul or Teresa pressed down on my lower back. I don't remember vocalizing as much this time around as I did when laboring with Bookie, I think because I knew she was sleeping down the hall and it was a lot easier to labor with her asleep. I do remember at one point saying aloud that I wanted to try to bear a contraction without bending at the waist and doing counter pressure, to see if the effect was different. I think I wanted to see if that would change my intensity measurement at all. And from what I remember, yes, it did--the pain was toe curling when I rode the contraction standing upright. After it passed I remember saying something like: "Oh no I am not doing that again, uh uh, absolutely not." I believe we had put a call in with the doctor call service about 20 minutes earlier, but hadn't heard back yet, and I trusted my instinct after the 11:28 pm contraction and said, "Doesn't matter that we haven't spoken to the on call doctor, we are going now." I knew it would be around 40 minutes until I was admitted to Labor & Delivery, since it would be about 10-15 minutes to get dressed for the late night March cold, another 10 minutes to get to the hospital and park, probably 10-15 minutes to be admitted through the emergency room as I was instructed to do after hours, and then 5-10 minutes to get to the 5th floor Labor & Delivery unit, then the nurse would need to check me in triage...and then, I would be admitted, assuming I was as far along as I felt, because remember, I would be having contractions every 2-5 minutes throughout the whole trek to the hospital. I was absolutely right to decide to head to the hospital when I did, and my timing estimation was also spot on, as I was admitted at midnight and settled in my labor room by a little after 12 am. The ER triage was something else. I was in active labor, and the intake staff person apparently described my condition in my intake as not that big a deal. I forget what she actually wrote or coded me as, but when Priscilla received me a little bit later, and saw me bear a contraction then checked me, she was like: "Oh, you are way farther along than they in ER led us to believe, let's get you into a room." We also had to produce my license and other documentation in the ER triage room, again while I kept having to pause, brace myself against the wall, have Paul push on my lower back, and bear a contraction, all while the intake staff person looked on with a blasé attitude. Surreal is the best word I can use to describe it. I requested intravenus pain meds, and as she inputted my info (weight, etc.) and got my IV ready I threw up my dinner and my waters broke all over the floor of my birthing room (waters were clear though). This moment doesn't really need any additional details as these details sum up what happened exactly. With Bookie I was able to manage without an epidural, so my plan was to aim for the same with Little Jem. But with Bookie I had a positive experience accepting pain meds, as they helped me relax enough during late labor for the contractions to do their job, so I immediately requested the same with Little Jem. The only detail I can add about retching and throwing up the contents of my stomach is that as I threw up, I could feel water gush down my legs. I was in a hospital gown by that point I think, but had my own slide on slippers, and they got totally covered in all my bodily fluids. We were happy to put them in a plastic bag and throw them away. I also said "Sorry about that" to Priscilla and she said, "Oh, no worries, it happens all the time, it's what this room is for" so that made me feel more comfortable doing what I needed to do bear labor in that space. This was at Moses Taylor Hospital by the way--my birth experiences with both babies were nothing but positive there. The fact that my waters were clear was important because it meant Little Jem wasn't in danger of breathing in anything that could hurt him like meconium, at least so far. Wed March 22 at 12:00-2:30 am: contractions lying down while on meds, holding Paul's hand, going from 6-9 cm; I don't remember much here, was very loopy (drug: Nubain, probably a dose designed to wear off 2-3 hrs later and *before* pushing [though it turns out it was still in full effect when it came time to push, more on that below]) and even slept through some of the contractions (!). I did keep asking nurse to be gentle when checking me, but then would say "Don't mind what I'm saying out loud, don't let it interfere with your job" (lol). Alternated between talking about FAB/search committee/IL [information literacy] program with Paul and reality such as ice chips, needing to hold Paul's hand, and requesting to be checked. Paul tells me I rode the contractions with deep, quiet breaths while holding his hand. That is my log entry almost exactly as I composed it maybe a day or so later when recording my experience of happened, with Paul's help of course. But this too was very surreal, and apparently hilarious to those in the room, Paul and Priscilla the nurse (though not at my expense, from what I gather). For longtime blog readers, you'll recognize the acronym FAB to be the Framework Advisory Board, which in March 2017 was in its last few months of work before the group was being merged with another Association of College and Research Libraries standing committee, SLILC. I was apparently talking stream-of-conscience about FAB and all the loose ends I had been working hard to make sure were tied as I went on maternity leave. The search committee refers to the search for two new Research & Instruction Librarians that was taking place that spring at my library, which I participated in as a committee member, both before and after Little Jem's birth. I was able to phone in for important parts of the search process, including the in-person interviews of our final candidates. It was important to me to participate because these two new hires would be working with me in the Information Literacy Program, which was going to be under my leadership as of June 1 of that year, so it must have been on my mind as well. I feel like this log entry is evidence of the integrated whole that was my life and person, as I physically labored to birth my baby and was simultaneously mentally processing and working through all these parts of my job out loud. For the record, I remember almost none of this--the Nubain dose must have been pretty strong--but it also means I don't remember the contractions from 6-9 cm, which is really incredible, especially since they still did their job of dilating me, and that's no joke friends. Before continuing with my birth experience, I'll close the loop on these various projects I was talking about while in labor and on pain meds: FAB successfully merged with SLILC that June, we successfully hired two new librarians as a result of that search, and the Information Literacy Program is alive and well under my leadership. (Oh, and I also now have a beautiful one year old boy I get to be mother to.) So Donna-in-labor didn't have anything to worry about (ha). Now back to the log. 9-10 cm, maybe 2:30 am: Suddenly wanted to push, was told I was at 9.5 cm so Priscilla helped dilate me the last bit during a contraction (her hand was at my cervix during it!). It worked. I was telling her and the on call doctor (Dr. Molnar) I really, really needed to push. They finally said I could. Priscilla helped pull back my legs, Paul held one she held the other, instructed me to pull back on both from behind knees (this was very hard to do). Also somewhere around this time they noticed light meconium so a NICU team came in to help. No extra details to add here, as clearly my log entries got a lot more detailed at these points. Priscilla helping to dilate me the last 0.5 cm during a contraction was totally rad and awesome, and I can only assume the Nubain is what enabled me to bear it, and why she offered to do it to begin with. As I indicated earlier, it was clear to all that it hadn't worn off yet. Pushing, 2:30-2:41 am: When I said I needed to, I pushed once on a contraction. Priscilla said baby's head was high up and I'd need to focus on pushing him down through the canal. Just before second push, Priscilla told me I could probably push baby out on one more push. I believed her (yay Nubain lol). Then I did. Emphasis added. If I can say so (and I believe I earned the right to): I am a mama-warrior-badass, and I'm so proud of myself for this moment in Little Jem's delivery, when Priscilla told me she thought I could push him out in one more push, I believed her, then I did it. Bam. Pushed on next contraction, key was she told me "no sound" (I had been vocalizing; I listened to her and didn't vocalize on this one) then she instructed me to breath twice more during push--these felt like separate pushes but everyone around me seemed to count it as one continuous push. Ended with pushing baby out completely. Kept my eyes closed at first to internally "recover"--told Paul to stay with baby and bring phone to take pictures. Now I am going to share the facts of Little Jem's birth, as I did at the beginning of Bookie's birth story post. This time I wanted to share them at the end, since I composed this around the structure of the birth log I kept. I have two more birth log entries to include here, that unpack some of the facts regarding Little Jem's birth injuries. Day 2 was told about his cephalohematoma and bilirubin levels, monitoring commenced etc. Going into the details of our experience as parents with Little Jem's elevated bilirubin levels and his cephalohematoma will make this post too long. Perhaps I'll reflect on these things another time for the blog, but more likely I won't, largely because both issues did resolve themselves in time and with monitoring and following doctors' instructions. I did have a little guilt at first caused by the fact that how fast I pushed him out caused a head injury, and maybe that happened because I elected to be on the pain med, but then when I reflect honestly on the experience, I realize I did what I was suppose to do--push him out safely--and that it was okay that it was not perfect, and just part of the complex, messy experience that is giving birth. All births are complex, no matter their method or manner. It is part and parcel with the experience of giving birth. And Little Jem is here, and healthy--his bruising and head bump healed and cleared up in due time. And we are so very grateful for him.